What Can You Do With Llamas? Llamas have a personality much like a cat. Llamas do not spit on people unless abused usually. Spitting establishes dominance in a herd. The right llamas are quite easy to handle, care for and raise. Some breeders have estimated that healthy quality llama geldings could cost you as little to feed and care for as your large pet dog. Llamas eat 1/4th of what a horse eats and can be kept on under an acre. They like companionship of some other livestock and/or other llamas. A good well-trained gelding/female will run about $500-2,500.00 dollars usually. Many livestock owners keep llamas as companions for their goats, sheep, cows and horses. We have heard of llamas who were used to keep horses company too. A good kick from a horse can kill a llama, so this must be done carefully. Sheep ranchers have had llamas for many years to watch over their sheep from coyotes and dog packs. A well-suited guard llama (all llamas are not cut out for this job) will position themselves between the predator and the animals being protected. When challenged they often times will come down with their front legs and scare the predator away. Most sheep ranchers will tell you that the llama reduced their lamb/sheep loses.....BUT not all llamas will guard! Don't be fooled into thinking that the llama will guard just because someone said it will. Know too that intact males and geldings may breed and kill smaller livestock so we don't recommend them as guards ever. We only recommend female llamas for guarding and NEVER geldings or males. You don't know if they will breed your smaller livestock until you take the chance and in our opinion it just isn't worth it. We have an article HERE that you can read about guardian llamas. 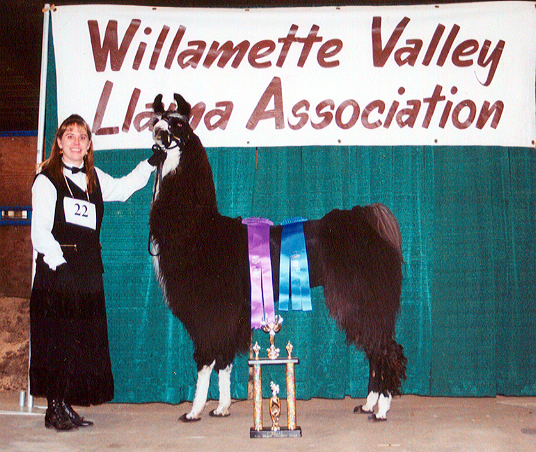 Much like "A" system horse showing, there are llama show systems around the country called ALSA and ILR-SD. At a llama show llamas are entered in Halter, Showmanship (Fitting and Showing), Packing, Public Relations, Costumes and Cart Driving. 4-H and FFA have local fair divisions too for youth to show in. 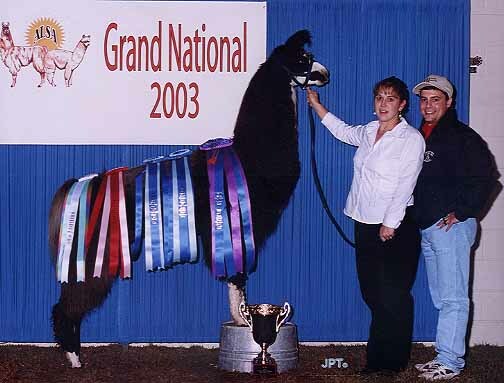 In a halter class the llama is judged on its conformation. In Showmanship, the handler is judged on its ability to present and show off their animal with a set of guidelines. In Packing, the llama carries a set number of pounds in their pack through a series of obstacles. In Public Relations, the animal is judged on their ability to cope and interact with the public in various situations. In costume, the animal and handler wear a costume with a theme. 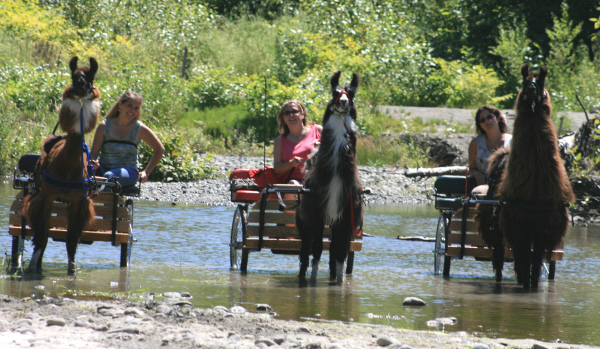 In Cart Driving, the llama does a pleasure drive and an obstacle drive. 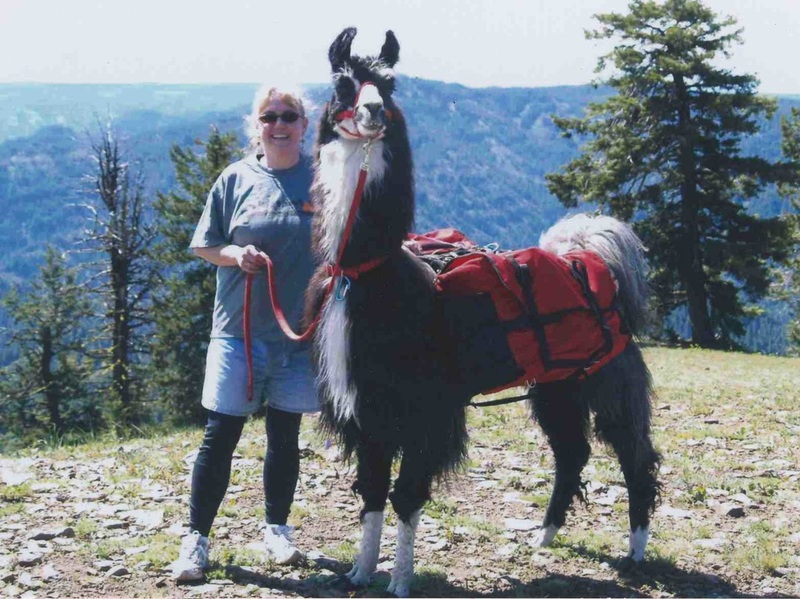 Other activities that llamas participate in are Pack Trials and Jackpot Classes. These trials are all over the country and appeal to a variety of ability levels. The llama carries a certain number of pounds in their pack over a set outdoor pack course for a certain distance. The animal receives a certificate upon completing the course correctly. Jackpot classes are beginning currently for people to participate in at shows and make a little money. The entrants pays a certain amount and it is put into a pot and paid out to the winners of the class. Llamas can be great therapy animals if used wisely. Not all llamas are safe for visiting and good about not going potty indoors. Some special llamas are and will visit people in their rooms, easily backing around equipment and through doors to exit rooms. A well-trained llama is very safe and easy for small children and family members to handle and enjoy. If you have questions or would like to inquire about how to purchase a llama, please feel free to contact our farm or others in your area.